The image above does a fairly decent job, even taking into consideration that scans never perfectly reproduce the real thing, of showing you how the cards differ from one another. The pocket deck was intended to be used alone, without the companion book, so the meanings of the cards are written on the card faces. As you can see, the colouring on the large cards is much lighter than the colouring on the pocket deck. The blues and greens of the backgrounds are also different. The large cards have a thin white border; the pocket deck cards have no border. The large cards were numbered, making is easier to find information about them in the companion book. The images below show the card backs. The book has been printed dozens of times (over 30 just for the original 44-animal version published by Bear and Company). The original book appears to have been published in red and teal editions (both with gilded lettering), though I don’t know if there is a pattern to when or where each colour was used. 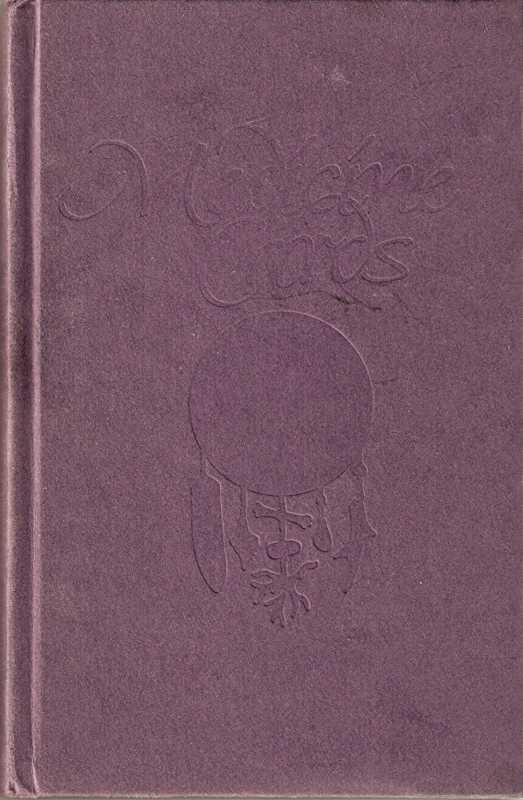 The expanded edition book was initially printed in purple (with and without gilded lettering). I’ve seen several different versions of the companion book that seem to differ only in the color of the cover binding — purple (with and without gilded lettering), teal with gilded lettering, and red with gilded lettering — and quality of the printing. Seems to have been sold as a separate book in May 1992 publication (per Amazon.co.uk). At least 34 editions of this version of the book were printed. The package I have, which contains the 34th edition of the book, includes a sticker that indicates that over 600,000 copies were in print at the time. Features information about only the 44 original animals. Published 1999 by St Martin’s Press. This is the initial look of the companion book that came with the revised, expanded edition of the card deck. Description: The lettering on the spine is gilded, but the lettering and image on the cover is just debossed, with no gilding. The first edition of this book was fairly poor in quality when compared to the original book. For example, the print on some of the pages is slanted slightly and offset incorrectly on the page (presumably that’s due to a problem with the machine that trimmed the pages), and Angela Werneke’s name is misspelled in her biography at the back of the book. I don’t know how many reprints it took them to correct those problems. Jamie Sams – Jamie Sams’ personal site. Includes information about her other works. 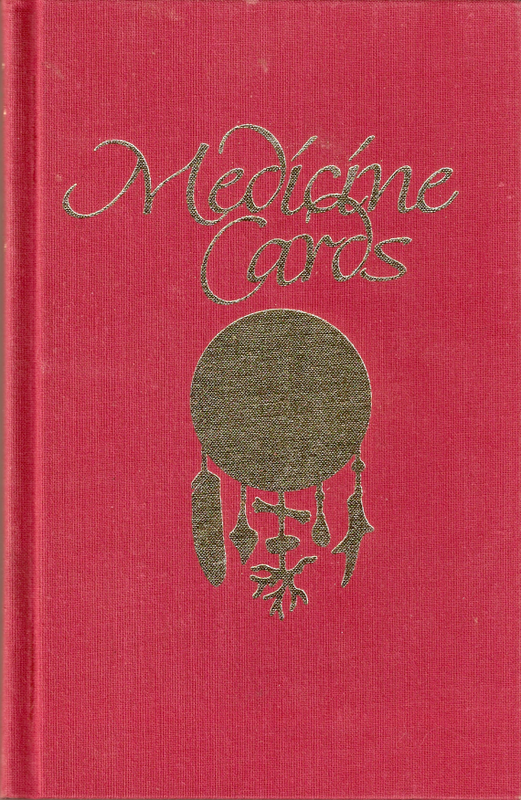 Medicine Cards – David Carson’s personal site. Includes information about his other decks, books, and related merchandise. River Light Media – Angela Werneke’s personal site. Aeclectic Tarot – Brief information, sample card images, and a review. Learn Tarot – Brief information about deck plus a few card images. 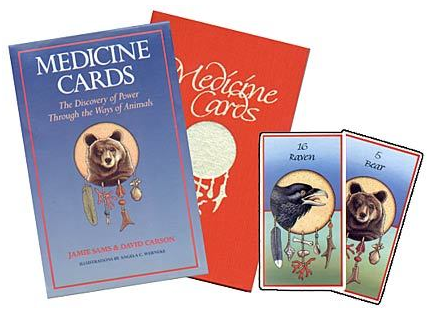 Medicine Cards by Jamie Sams and David Carson – Review of the 52-card deck by Lauren D’Silva at BellaOnline. I was given a copy of the pocket “Just For Today” deck by a friend. I’m still not sure if it was a permanent gifting or just a temporary one so I’m presuming I have temporary stewardship until she asks for it again. 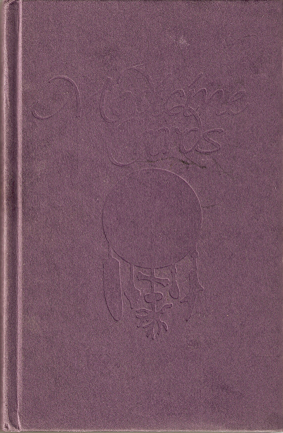 The deck, in a very dilapidated tuck box, came to me with a purple hardcover companion book. Other than flipping through the cards a couple of times, I’d never really looked at the deck or the book. Recently, while reading “The Complete Idiot’s Guide to Pet Psychic Communication” (one of the exercises suggests working with this deck), I was reminded that it was sitting on my shelf, waiting for me to take a deeper look at it. I’m not sure how the pocket deck and the new companion book came to be paired in my possession — as far as I know, the book was never available for sale separately, and the pocket deck didn’t come with a book. 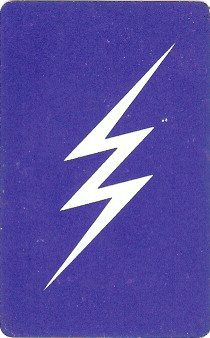 The backs of the cards are very homely: solid royal blue background with a simple, white lightning bolt on the pocket deck and solid turquoise blue background with a yellow lightning bolt on the larger deck. The size and simplicity of the cards make it easy to underestimate the power of the deck, but it’s still surprising to me, now that I look closely at it, how cheap and almost comical the card backs make the deck look. 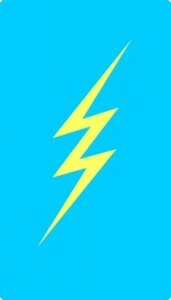 (Jamie Sams uses the yellow lightning bolt on her Web site as well and I just don’t get it.) I’ve read comments by other people who love the card back so perhaps it’s just a matter of personal taste. I admit to being a little disappointed that the fetishes on the cards are just adornments that don’t have any actual relevance to the animals or concepts in question. 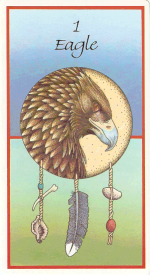 Given the importance assigned to the nine totem animals that each person supposedly has, the fact that the nine different fetish arrangements on the cards have no significance and are just repeated in order through the deck seems a waste of potential. It would almost have been better to have the same fetishes on all cards so there wouldn’t be an expectation of meaning where none exists; they would just be seen as the decorative accents they are. The pocket deck cards are a perfect size for shuffling and riffling, even if you have small hands. The larger cards are a fairly decent size for handling, though clearly not as small and handy as the pocket deck. Though it is advertised as a divination deck, I see it more as an exploration deck or perhaps even an affirmation deck, depending on how you use it. I like it for simple, one-card draws — the spreads in the book look enticing but I just haven’t had time to really try any of those out. 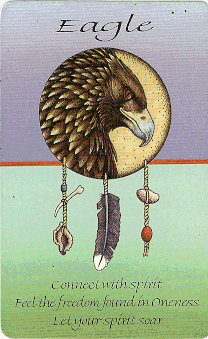 I plan to do the Nine Totem Animals reading, which you are advised to only ever do once for a person, soon. And I’ll try the other spreads when I have a chance. For now, I’m giving this a 3/5 just because it doesn’t seem to visually live up to its potential. I may change that rating after I’ve done a few readings with it. 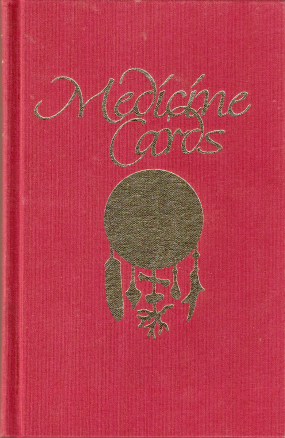 Do you know where I can get a set of these little cards: Medicine Cards:Just for Today? I gave mine to a student several years ago and now want to use them in a class starting July 12. I live in Canada. You’re probably not going to find the original “Medicine Cards: Just For Today” deck anywhere for any kind of a reasonable price. (The only copies I’ve seen online are second-hand and are going for $170 or more, which is ridiculous — they’re nice cards, but not that nice.) The second, expanded edition of the deck (with the book) is available pretty much everywhere, including Chapters and Amazon.ca, for roughly $20. Thanks so much for the info. What a drag!! I really need the small deck as these students can only handle simple English. Wouldn’t you think that someone has a small deck they want to sell for the reasonable price? If you’re a member of Aeclectic Tarot, you could always ask in their forum if anyone has a copy they want to sell. I sent you an email this afternoon. I’m not a member of Aeclectic Tarot but would buy a copy if someone wanted to sell and if I could post. This is all time specific though as I’m teaching at the end of next wk. Thanks for the suggestion though. Sorry, I missed your comments when you initially made them. If you’re talking about the original 44-animal deck with the yellow lightning back, those (like the 44-animal pocket deck) are hard to find. I’ve seen copies come up on eBay occasionally, but not very often. The 52-animal deck, on the other hand, is very common (it’s the currently-published version) and you should be able to buy them at your local book store. (They also come up frequently on eBay.) If you really want a deck that matches the original 44-animal one, you could always buy the new version and just remove the 8 new animal cards. I wish the publisher would take the hint and produce the small deck again. I used to love to carry the animals around with me and they’d help me make decisions, even warn me of impending danger. I lost my little deck on the way to my mother’s funeral. Was Mom trying to tell me to make my own decisions? I got any psychic gifts I have from her. And I still need the cards–I use the large deck at home, but it’s not the same so please Ms. or Mr, Publisher, give us back the little pocket deck. Hello-I see where no one has posted to this in about 3 years. But I had the original deck and companion book. I thought it was the original anyway. 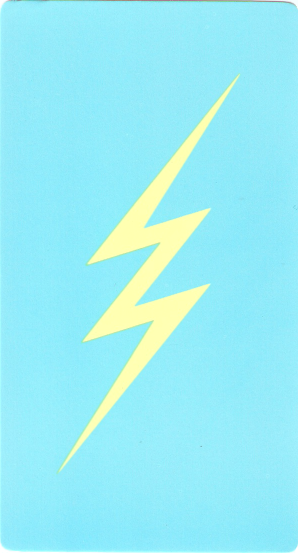 All the backs of the cards were blue with the yellow lightning bolt, but the companion book was also the same color blue with a yellow lightning bolt in the front of it. I believe it came with a book jacket on it that looks the same as the front of the books now. Does anyone know where I can find a set exactly like that? Or do you know when it was printed? Thank you. I don’t know that you’ll be able to find that exact set (I’ve never seen a blue book with a yellow lightning bolt on it or with a dust jacket anywhere) but you might be able to find a set with the original 44-animal deck on eBay. (Typically, the slipcase for the original set features the bear image, where the newer sets feature the eagle.) I see a couple of the original sets up on eBay right now. 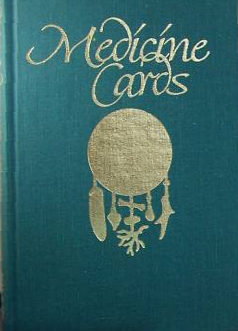 The book I was talking about having that was the same turquoise color in cloth with a yellow lightning bolt on the front-the illustrations in it were colored just like the ones on the cards. And the pages were thick, silky like pages-you could not see through them. And the card deck that was with them was a little bit wider than the cards now and much thicker almost like more than one layer of paper. I took your advice and ordered a set of ebay. It says that the set was printed in 1988 by Bear&Company, but the quality of the cards and the quality of the book is just not like the set that I had. I wish I knew now exactly what was written inside the printer’s page of the book I had. Anyway-I let a friend borrow the set that I had and she had an accident&died before I had a chance to get them back. I couldn’t bring myself to go ask her family for them. Hmm, perhaps there was a version published before the Bear & Company ones, perhaps put out directly by the authors? I’ve never seen one, but that means absolutely nothing. I’ve been meaning to write to one of the authors to find out more about the history of the deck — I’ll go do that now. Thank you for your explanation of the different publications and the difference between the cards. I was very confused about them until I found this site. Now I know I only want the 1997 Pocket Deck, which is, of course, the hardest to find. I think they printed the new edition and took the meanings off the cards in order to sell more of the books. Sad . . . . It’s just too easy and convenient to have the meanings written on the cards, no? Now take the meanings off and make more money, money, money from the cards. What they have forgotten is that the Universe will give back to you as you give to it. Their greed will be repaid. I bought my book and cards in 1988 and studied with Jamie for two weeks in a retreat spa near Guadalajara, Mexico. She is an amazing woman. Then about a year later I spent a week with Grandmother Twylah in Buffalo, NY at her home and sweatlodge. I still have my book signed by Jamie but cannot find my cards so went on a internet search and stumbled on your site. So sorry about the extreme delay approving your comment, Carol. This site (and others) fell along the wayside during the last several years and I never even thought to check for comments. Glad you found the page. And it’s very cool that you actually got to study with Jamie. I no longer have any of my copies of this deck, and I was thinking today that I miss it, especially the little pocket deck. Card Kitten is powered by	WordPress 4.9.10 and delivered to you in 0.579 seconds using 46 queries.